One of the most famous names offering certified Yankauer Suction Set; we are backed with excellent staff members. We are involved in delivering perfectly designed, durable and affordable Yankauer Suction Set. We have years of experience and expertise, thus, we present the best Yankauer Suction Set. 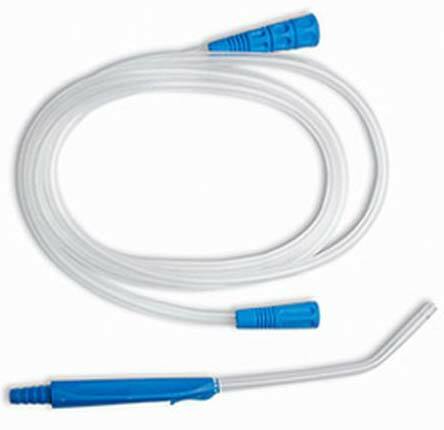 Yankauer Suction Set is suitable for convenient removal of secretion, blood and mucous post operative. Complete set is provided with Yankauer Suction Tip mounted on 2 mtrs / 2.25 mtrs. long ribbed tube provided with Universal connector at both ends. Ribbed tube is kink resistant and has the strength to withstand the suction. Universal connectors are molded from soft PVC, so as to accommodate the Suction tip on one end and all type of connectors of suction apparatus at the other end. Vent port is permanently closed with tight fit sleeve, which can be removed with small incision by blade to change over to vent control system. Individually packed and ETO Sterile.